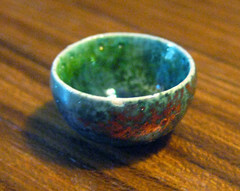 This bowl is smaller than a dime and was wheel thrown then raku fired. 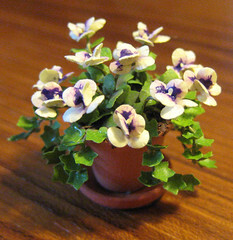 This is about 3/4 inch tall. The people selling these had all different kinds of plants. 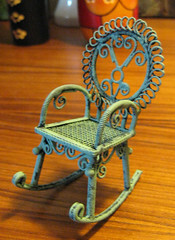 I couldn’t pass up this tiny garden chair. I was really looking for some mid-century modern chairs but there was really nothing in that style. All of this is for my realpuki soso that should arrive sometime in September. I just can’t resist that smile she has. I have been busy making her a home, a little decorated box, and now I have a few things to fill it with! 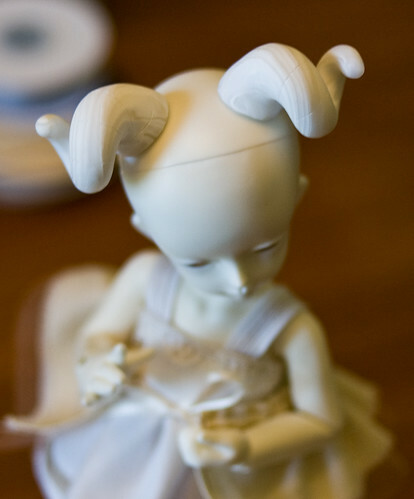 My magnets came in from K&J Magnetics so I got to work last night on the horns for the open eyed syen head. She is on a body with beyla hooves so I thought some horns would work well. I made these out of transparent and white Fimo. I like how they have a marbled look so if I do any blushing it will be real light. After some sanding they look nice. I can’t wait to see them with the wig I’m waiting for. 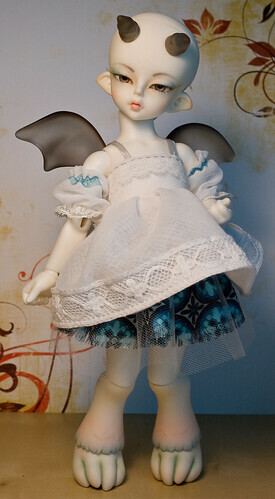 Yesterday I finished the faceup and blushing for my Syen. I’m happy with how it turned out, even the eyebrows. I have so much trouble with eyebrows. This was the latest dress I made. I am never making little puff sleeves like this again! She came today so much earlier than I expected. I love her gargoyle feet and wings. I haven’t made up my mind about the horns but they are growing on me, but I don’t like the gargoyle hands, they almost seem too big for her. These are some of the dresses I have been making, the one on the left isn’t finished yet. I’m going to have a couple of bald creatures for a while as their wigs have not arrived. I’m not sure if I’m going to keep the Ai head (seen on the left doll) or use the open-eyed Syen. I’m very happy with Syen, though her vampire head will need some sanding before I do her faceup, its a bit rough. I got my shipping notice from Soom. My Syen will be here next week. I was expecting sometime in August but this is great. I’m working on clothes for her this weekend and I think I have eyes that’ll work but I’m still waiting on the wig. Now I need to think up a name.